A French-American astronaut duo ventured outside the hatches of the International Space Station on Friday for the second spacewalk in one week dedicated to the integration of new batteries put in place by the Space Station’s robots in an extensive effort to rejuvenate the ISS power system as the complex heads into its last decade of operations. Shane Kimbrough, conducting his fourth spacewalk, and ESA Astronaut Thomas Pesquet, a first-time spacewalker, spent five hours and 58 minutes working outside – installing a series of three adapter plates to connect new Li-Ion batteries to one of the Station’s eight power channels. 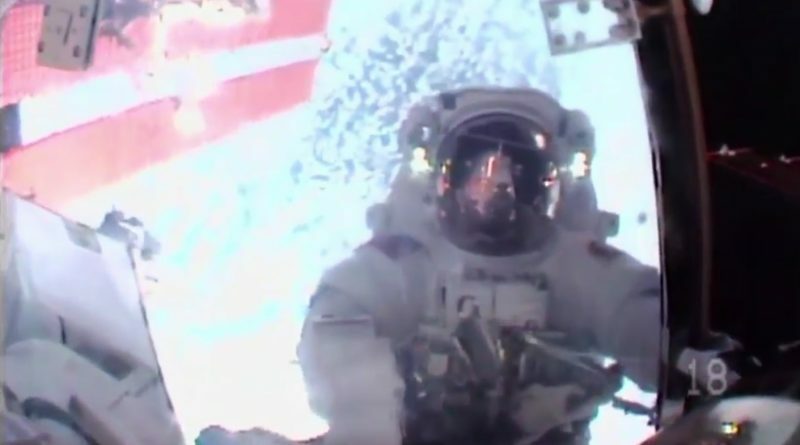 The battery replacement was a cooperation between spacewalking crew members and the Space Station’s robots that were in charge of removing old batteries & putting new ones in place while the crew lent a hand with tasks the robots could not complete. Two weeks of intense robotic operations and a pair of EVAs were needed to replace a dozen aging Nickel-Hydrogen batteries out on the Station’s starboard truss with six higher-capacity Li-Ion batteries and three Adapter Plates; nine of the discarded batteries being disposed of while three remain attached to ISS as spares. The Space Station heavily relies on its batteries, storing power generated by the four iconic Solar Array Wings to power the Station’s systems while in darkness – on average 35 minutes out of every orbit around Earth, 16 times per day. This places great demands on the Station’s batteries, undergoing nearly 6,000 charge-discharge cycles per year. 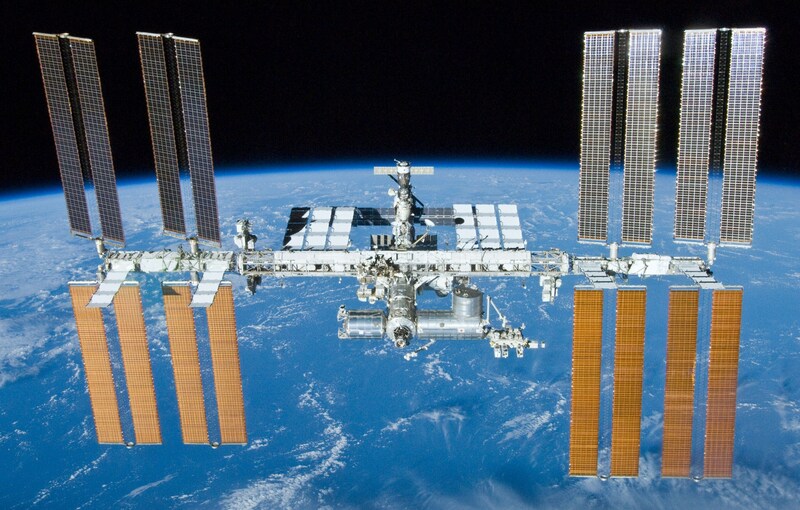 Given the number of cycles demanded from the batteries and the multi-decade lifetime of the Space Station, the power system was conceptualized for a complete replacement of all batteries at the mid-point of the Station’s operational life. 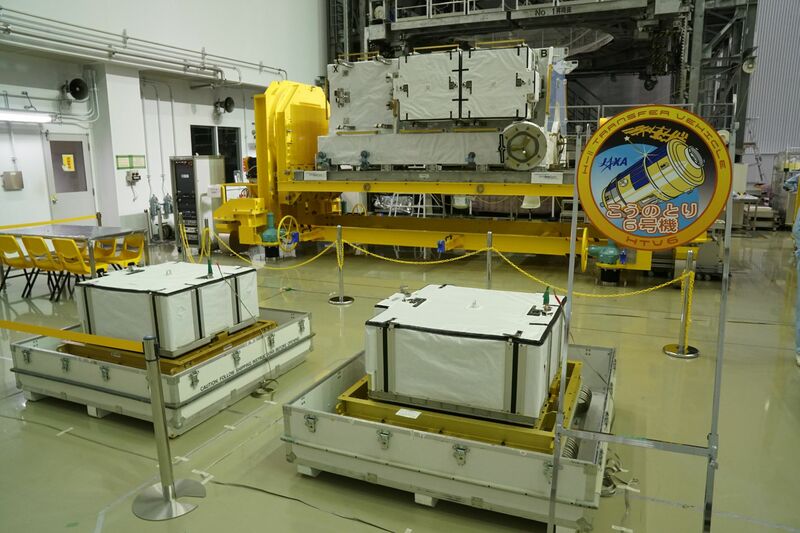 This replacement unfolds over a period of years with new batteries being delivered in batches by Japan’s HTV cargo spacecraft to revamp two of the Station’s power channels at a time. With the battery replacement on the horizon, NASA decided back in 2009 to take advantage of the opportunity and transition ISS from Nickel-Hydrogen battery technology – considered antiquated by today’s standards – to Li-Ion batteries that offer a higher energy density and have become standard for almost all spaceflight applications and are omni-present in consumer electronics on Earth. The Space Station’s original Electrical Power System facilitated a total of 48 Ni-H batteries that were considered state of the art when the Station was designed in the 1990s due to their intrinsic over-charging protection and robust architecture. Two of the 169-Kilogram Ni-H batteries were connected in series to form a 76-cell string, each battery containing 38 individual cells that hold gaseous Hydrogen at high pressure, created during the charging process. All the Ni-H batteries on ISS have already outlived their original service life of 6.5 years. 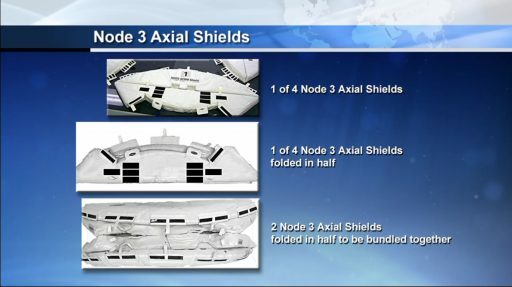 P6, the oldest truss segment of ISS, was launched in 2000 and had its batteries replaced in 2009 & 10 while the P4, S4 and S6 trusses have had their batteries installed ever since being launched in 2006, 07 and 09. The new Li-Ion batteries, rated for 60,000 cycles or ten years, will sustain the Station out to its current end-of-service date of 2024 and support a possible extension well into the second half of the next decade. 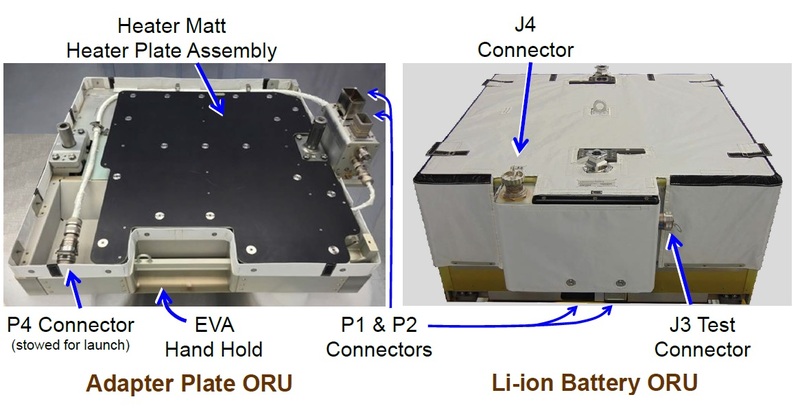 The new Li-Ion Batteries, provided by Aerojet Rocketdyne, are built to the same form factor as the Ni-H batteries to fit in their place with one Li-Ion battery replacing the capacity of two Ni-H units. Eliminating half the batteries cuts the number of launches in half and simplifies the station’s power system, also eliminating a regular conditioning processes on the batteries to mitigate ‘battery memory’ on the Ni-H units. Internally, the new batteries consist of thirty Japanese-built cells arranged in three banks of ten plus control units with redundant controls that monitor the temperature of each cell and provide circuit protection. Each battery weighs 197 Kilograms and measures 104 by 94 by 48 centimeters in size, capable of being handled by crew members or the Station’s robots. Special Adapter Plates were launched with the new batteries to take the role of the no-longer-needed second battery in each string, essentially just patching electrical and data connectivity between the new batteries and their respective Battery Charge/Discharge Units. The focus of attention for last week’s robotics and spacewalk was the 3A power channel that had its six Ni-H batteries removed and replaced with three Li-Ion ORUs and Adapter Plates, giving ISS its first power channel entirely driven by Li-Ion battery technology. 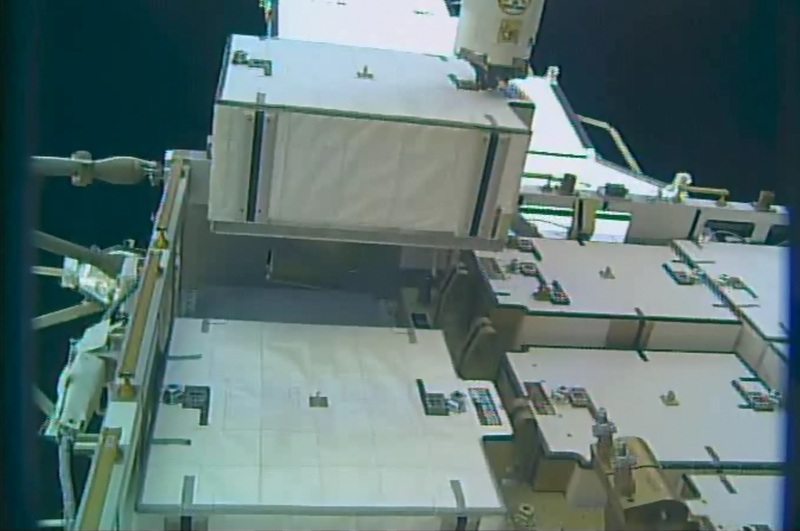 For this week, the same operation was lined up on the 1A power channel to give ISS two revamped power channels. The Station’s robotic duo – the 17-meter long Canadarm2 and two-armed Dextre robot were in action Sunday through Wednesday night to move discarded Ni-H batteries from the 1A Integrated Equipment Assembly (IEA) to the HTV Exposed Pallet or temporary stowage locations and install three new Li-Ion units on the IEA. 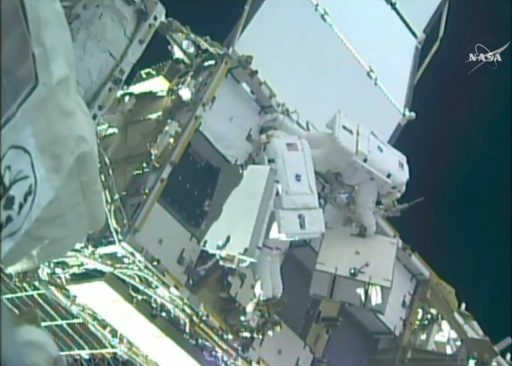 With the exception of two bolts that proved out stubborn, robotics went very smoothly, allowing teams to give the go-ahead for Friday’s spacewalk. 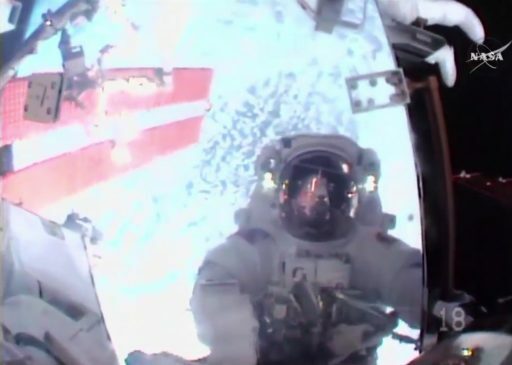 ISS Expedition 50 Commander Shane Kimbrough, having spent 6.5 hours outside ISS last week, reprised his role as the lead spacewalker for EVA-39, joined by ESA Astronaut Thomas Pesquet who embarked on his first spacewalk – becoming the fourth Frenchman to walk in space. 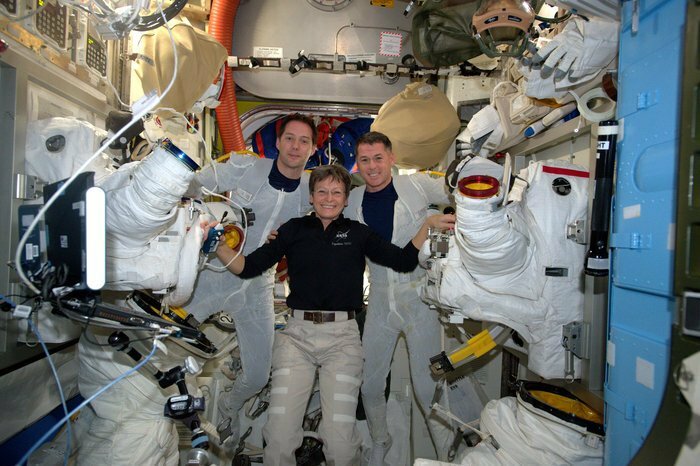 Starting their day bright and early on Friday, the spacewalkers were assisted by Peggy Whitson and Russian Cosmonaut Oleg Novitskiy to get into their suits and go through almost two hours of pre-breathe operations before being sealed off inside the Quest Airlock for depressurization. The preparatory process for Friday’s excursion went extremely smooth, allowing the astronauts to step out the door about 45 minutes ahead of the day’s timeline. The EVA formally started at 11:22 UTC when the spacewalkers transitioned their space suits to battery power, allowing them to exit the airlock – Kimbrough was leading the way. With the typical configuration of tethers and suit inspections complete, the crew quickly headed out to their respective worksites – Shane Kimbrough moved out to the S4 Truss Segment to set up shop at the IEA while Thomas Pesquet climbed onto the HTV External Pallet which delivered the new batteries and will take up nine discarded units for disposal. At the 1A IEA, Kimbrough installed a foot restraint and put in place handling aids on the lone Nickel-Hydrogen battery left on the IEA. He also checked off a quick get-ahead task of securing a series of clamps that once held the cover of the S4 solar array and had gotten loose – potentially coming in the way of future robotic work. Therefore, the clamps were tied down to stay out of the way. At the Exposed Pallet, Thomas Pesquet used a ratchet wrench to break torque on the structural bolts holding the Adapter Plates in place. The adapters and batteries use standard FRAMs (Flight Releasable Attachment Systems) with an H2 primary and H1 secondary bolt. Once both spacewalkers were at the EP, they used their Pistol Grip Tools to fully release Adapter Plates E and F that were then towed over to the 1A IEA, one by each crew member. Back at the IEA, the duo continued to work efficiently, seating Adapter Plate F in place and driving its two structural bolts to firmly attach it in Slot 6 of the IEA. In the process of installing the adapter, blind-mate electrical connectors engaged and data connectivity between the battery charger, the adapter and the Li-Ion battery in Slot 5 was hooked up by the crew via what is known as the P4 data jumper. Ni-H Battery 0080 was then removed from Slot 4 and placed atop the just-installed Adapter Plate F to remain in a passive state for the time being, available as a spare. Thomas Pesquet stopped by at the Slot 5 battery to tighten its H1 secondary bolt – a task that could not be accomplished by the Dextre robot earlier in the week. With Slot 4 freed up, the astronauts could install Adapter Plate E via its two bolts and data jumper – achieving the minimum operational configuration for the power channel with Mission Control reporting good connectivity to both batteries. While in the upper corner of the IEA, Pesquet again employed his Pistol Grip Tool to re-torque the H1 bolt of the Slot 1 Battery which had caused some headache earlier in the week when Dextre’s bolt-driving tool got stuck to that bolt. 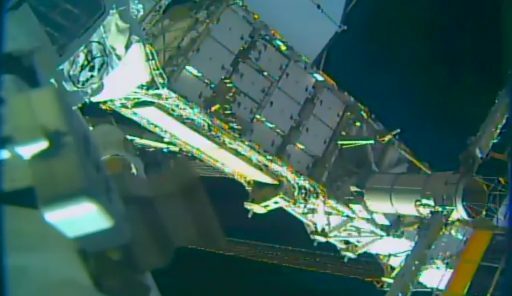 Tackling the final primary task of EVA-39, the crew went back over to the HTV Pallet to fetch Adapter Plate D, the last part to be installed in this round of outfitting operations. Measuring 104 x 91 x 38 centimeters in size, the Adapter Plates are quite large pieces of equipment to transfer, though at 39 Kilograms they are relatively light. 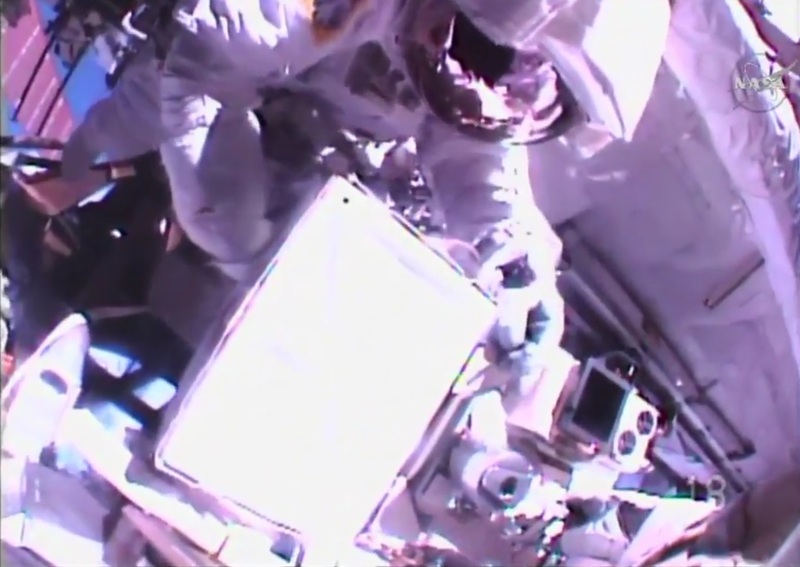 Both spacewalkers worked together to move the last adapter into Slot 2 on the IEA and install it via the two bolts and data cable. Mission Control was quick to confirm that all three of the newly integrated batteries were showing nominal operation – giving the Space Station is second Li-Ion -driven power channel representing a quarter of the ISS power system. All primary tasks of EVA-39 were complete by PET+3 hours, leaving the crew two hours ahead of schedule after an extremely smooth spacewalk up to that point. With plenty of time left in the day’s EVA, the team went on to do a series of get-ahead tasks from the ISS ‘job jar’ that contains activities left open on previous EVAs. 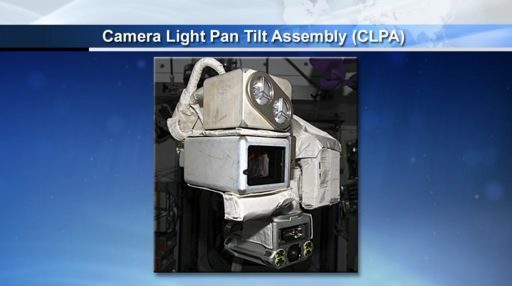 For the first get ahead, Thomas Pesquet moved back to the airlock to switch tool bags and then head over to the Mobile Transporter Relay Assembly where Shane Kimbrough set up a foot restraint to access a failed Camera/Light Pan/Tilt Assembly (CLPA). This CLPA was robotically removed from Canadarm2 and stowed on the Mobile Base System to be switched out with a functioning unit that will ultimately be installed on the arm to fully restore its vision when completing robotic tasks. What was believed to be a relatively straightforward task turned out to be much more complex when the astronauts could not reach the CLPA location with the foot restraint they had available. It took several re-sets of the foot restraint for Kimbrough to reach the failed CLPA, breaking out the Pistol Grip Tool once again to release the CLPA and put the spare unit in its place. Next up for Pesquet was a quick task on Latching End Effector A of Canadarm2 where he replaced a Worksite Interface Adapter that has been difficult to operate in the past. 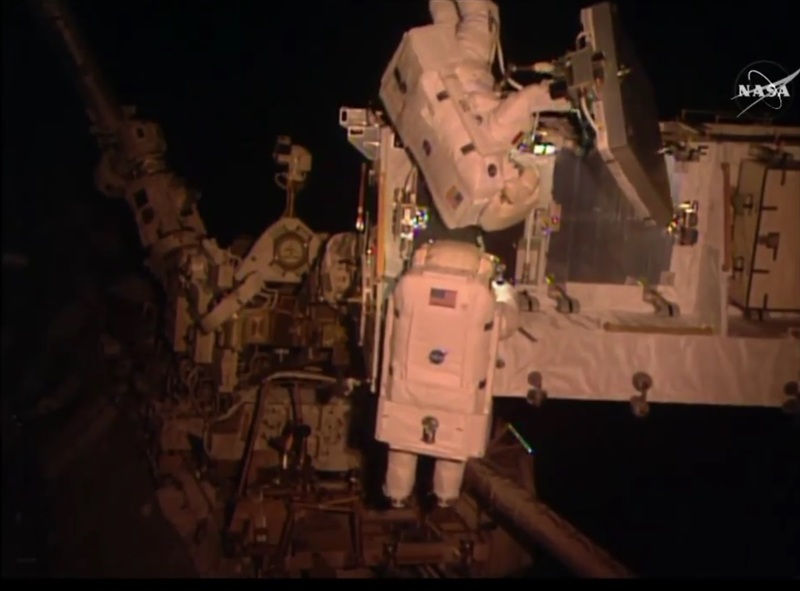 These interfaces on the arm allow spacewalkers to install foot restraints to ride on the tip of the arm for tasks needing both hands. Meanwhile, Kimbrough stowed the foot restraint used earlier in the EVA before both returned to the airlock to re-group prior to another two quick get aheads. Thomas Pesquet was tasked with collecting engineering imagery of the ‘Rat’s Nest’ – an area where the S0/Z1 truss segments meet the Station’s pressurized modules and where numerous fluid and electrical lines are located in somewhat of a chaotic setup. Future EVA work in that area will benefit from close-up engineering photos available to EVA planners. In the meantime, Shane Kimbrough moved forward to the Destiny Lab where he removed hand rails 0261 & 0262 to clear the way for the installation of Wireless Video Antennas on a future EVA. 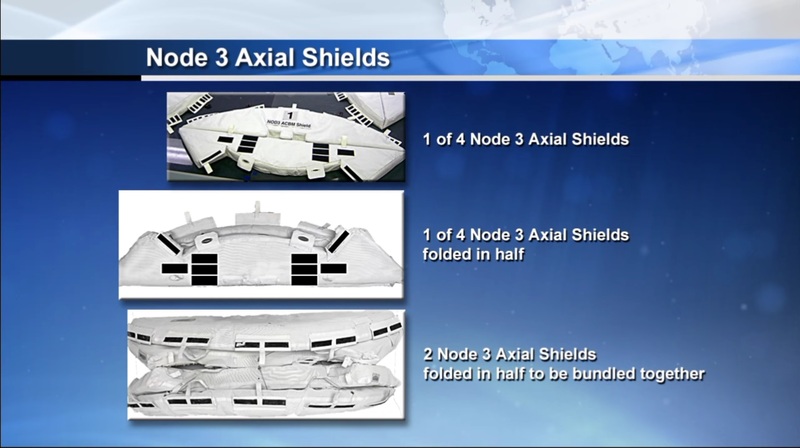 Finally, the two spacewalkers were set for a trip to Node 3 – picking up a bundle of covers pre-staged at the airlock during EVA-38/39 and taking it over to the Tranquility Node where the covers will be installed around the March time frame when Pressurized Mating Adapter 3 will be moved from Node 3 to Node 2. When removed, the PMA’s Common Berthing Mechanism will be covered up to protect it from the space environment. Having raced through their primary tasks and completed a series of get aheads, Shane Kimbrough and Thomas Pesquet actually ran out of tasks and could call it a day early. Ending the EVA in orderly fashion, the pair moved back to the airlock and configured their tethers before heading inside Quest to close out the spacewalk by hooking their suits up to ISS power & cooling and closing the external hatch. 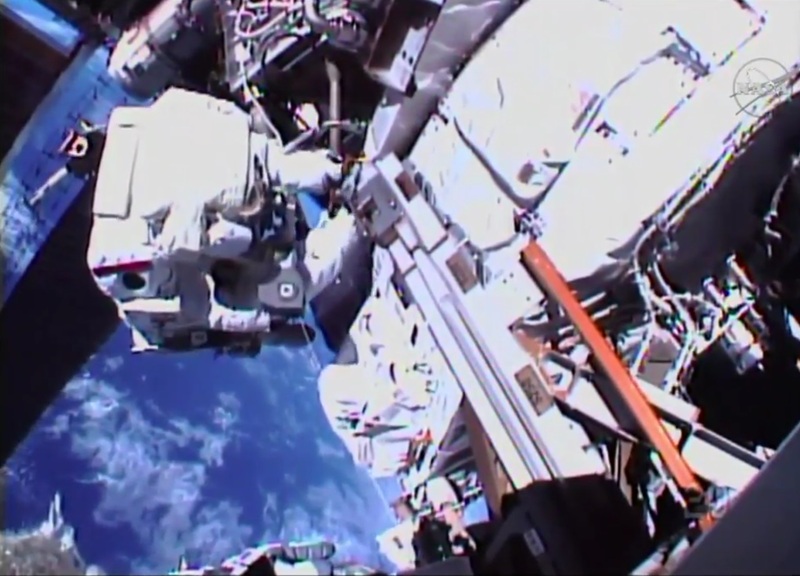 The spacewalk officially ended at 17:20 UTC after an elapsed time of five hours and 58 minutes, marking the conclusion of an extremely successful EVA. Friday’s EVA was the 197th spacewalk dedicated to ISS Assembly and Maintenance for a total time of 1,230 hours. Shane Kimbrough, now with four career EVAs, stands at a total of 25 hours and 22 minutes while Thomas Pesquet logged his first spacewalk for five hours and 58 minutes. The battery work outside the Space Station is not quite complete with three days of robotics planned over the weekend and into next week to transfer three old Ni-H batteries currently held by the Dextre robot to the three empty slots on the HTV Pallet that were freed up by the crew on Friday. Next week, Canadarm2 will pick up the Exposed Pallet and move it back into the Unpressurized Logistics carrier of the HTV-6 spacecraft to set up for its departure at the end of the month. The next batch of six Li-Ion batteries will be flown to the Space Station by the HTV-7 mission, currently targeting February 2018.